Ziferon, a prosperous mage from Neverwinter, came to hire the Dearborn Company to investigate a magical tinkerer who had taken up residence in an old mine shaft far to the east. There were also rumors that this inventor had come into possession of a magical artefact, a crown, for which the mage was willing to pay handsomely. Once at the entrance of the mines, the adventures were greeted by floating, wooden death machines, which proved to be unsuccessful deterrents. Eventually the party came to a split path, one leading down a long, dark conveyor belt, the other through two heavy stone doors. Despite splitting the party between them, and alerting the enemies by crashing wooden planks on the floor, the party managed to clear the room and reconnect before the machines had the chance to move. Then the party faced their greatest foe, two small mining drones which seemed to duck and dodge every attack, but who eventually fell under the crushing force of only a few blows. After a short rest and the discovery of the entrance to an old dwarven structure, the party was met by a towering, four-armed, poison spewing stone titan which, due to the party’s quick thinking and even quicker reflexes, died seconds after its activation. Nearby, in a hidden room, was the tinkerer, who by this time stood little chance. The party then retrieved the crown and, unnecessarily, the tinkerer’s head, returning to Dearborn for their reward. A peaceful spring day was interrupted for several members of the Guild by a local orcish farmer Thrag Bludstompr whose family was in immediate danger. While digging a new well, he and his farmhand had discovered a network of caverns occupied by some unseen creatures which attacked them. Unfortunately, Turi the farmhand fell to the creatures. Quickly following Thrag to his home that he shared with his human wife and half-orc daughter, the guild members found that it was infested with gigantic, mutated bugs. The guild members heroically exterminated the vermin both above and then below the surface. Regretfully, while fending off a large swarm of the creatures, Ashov the dwarven bard was bitten by a giant centipede and quickly succumbed to its venom. The rest of the members soldiered on, defeating the remaining monsters, including a humongous farmhand eating worm. During their exploration, they not only discovered a source of water for Thrag’s farm, but also a long abandoned dwarven quartz mine. Dearborn Company has acquired an abandoned mine to source ore for their forge and smithing shop. While overseeing the cleanup of the mine, guild leader Firiniel discovered the mine had been overrun with goblins. A team was quickly dispatched from the guild hall, but not before they arranged for a medical wagon to follow to care for any wounded miners. Arriving at the mine with little trouble, (dire wolves are no match for mages) the team coordinated to clear the goblins from the main entrance while Firiniel took a couple miners to scout for a back entrance to prevent a goblin retreat. While clearing goblins is normally an easy task, the team was surprised to find several goblin acolytes in the lower levels of the mine. Fortunately, Firiniel brought reinforcements and the goblins were cleared in no time. The mine has been cleaned up and the miners are busy at work. 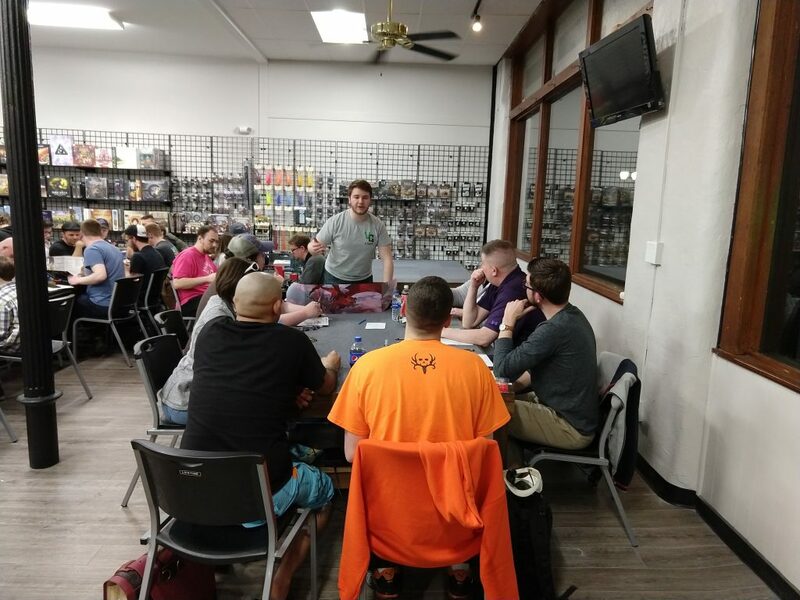 To join the adventures of the Dearborn Company, come to The Village Geek in Manhattan, KS every other Saturday at 5:30pm.